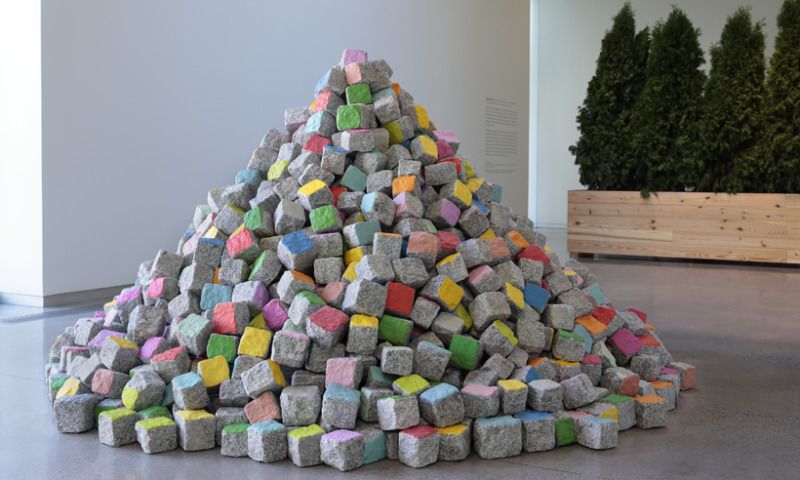 Pascale Marthine Tayou, Colored Stones, 2015-2018. Hedges, Edges, Dirt considers how we relate to our surroundings and to each other, whether we are rooted in place or in transition. Five artists—Abbas Akhavan, Jonathas de Andrade, David Hartt, Julianne Swartz, and Pascale Marthine Tayou—are each represented here by a focused body of work. This international group of artists—many of whom live outside their culture of origin—deploys play, beauty, and poetry to complicate and reimagine interrelationships among nature and culture, bodies and spaces. Their poetic, conceptual, richly material art is presented on the first and second floors of the Markel Center. As you explore, we encourage you to contemplate how the works on view relate to each other and to the space, and to consider these questions: What does it mean to perceive ourselves and others as native or non-native? As welcome guests or invasive species? How do we navigate real or imagined borders and boundaries? How do expressions of power, dominance, and vulnerability permeate our experience of place, self, and others?